Twin State Monuments was established in 1989 by Normand and Chantal Grenier, but its’ history goes back over 100 years further. John A. Harding started his monument business in White River Jct., on April 12, 1878. Most of his work was done in Italian marble. Upon Harding’s death on 1895, the business was taken over by W.A. Fellows. In 1915, Thomas J. Adams and James Edgar McNichol came from S. Royalton to White River Jct. and purchased the business from W.A. Fellows. The new Adams & McNichol showroom and plant was located on Maple Street and was said to be one of the finest retail establishments in the state. James McNichol died in 1922 and around 1961 the business was being run by Hugo Melen, himself an accomplished stone cutter, and the name was changed to Adams, McNichol & Melen. The company expanded into precast concrete and by the late 1980’s decided to get out of the monument business to focus their energy on concrete products. Normand Grenier started in the granite industry as an apprentice stone cutter in Barre, VT in 1961. 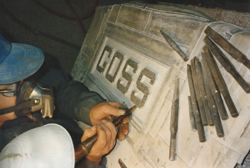 He spent 20 years specializing in hand tooled letters and finish work as well as statuary, using skills he learned at the Barre Trade School and from some of Barre’s best craftsmen. In 1981 a vacancy in the sandblast department where he was working allowed him the opportunity to learn sandblast and shaping techniques while continuing with his finish work. In 1986 Normand and Chantal sold Abbiatti Monuments and purchased a monument company in Bloomfield, CT. It was a thriving business situated across from one of the largest cemeteries in the area. They remained residents of Brattleboro and after 2 years decided the commute was too much and one day when two brothers commented on how well the business was going Normand responded, “It can be yours” and shortly thereafter, it became theirs. The Grenier’s decided they wanted to continue in the monument business. Twin State Monuments was established when they purchased the equipment and inventory of the Adams, McNichol & Melen Monument Company. They found a perfect location to start on busy RT 4 where they spent 24 years building a reputation in southern Vermont and New Hampshire for quality granites and exquisite workmanship. From the beginning the Greniers’ closed the office during the winter months and headed south. All the business calls were forwarded to them and they continued their commitment to their customers from the comfort of warmer climates. In the fall of 2013 they felt it was-time for them to retire from the monument business and to pass on their knowledge and skills in the tradition of all good craftsmen. In December, it was sold to John Clegg, Jr. of Clegg’s Memorials in Morrisville. Clegg’s Memorials is a 3rd generation family business started by Ernest H. Clegg in 1930. The business is headquartered in Morrisville with a sales office in New Haven. It’s the goal of the Clegg family to continue the tradition of providing quality products and services to the families of the Upper Valley that was started by John Harding some 125 years ago.